Do you find yourself shying away from presentations? Perhaps hesitant to take certain career paths because you fear that presentations may be involved? Maybe you find yourself holding back from speaking up or asking questions in meetings? 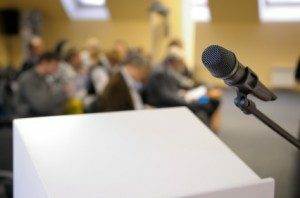 You may know that you have something to contribute, and you may even want to present your ideas, but your fear of public speaking holds you back. If this sounds like you, then some hypnotherapy for public speaking can probably help. Hypnotherapy can help you get over your fear of public speaking so that, sooner than you may think, you find yourself able to remain composed and confident in front of your audience. Resolve any underlying fears that may be triggering anxiety and holding you back. Naturally manage your stage presence so that you feel more relaxed and in control. Change any unhelpful thinking or beliefs around your ability as a speaker and the value of your contribution. Personalised Hypnotherapy MP3s to help you get and maintain the right mindset. Simple and effective techniques for maintaining progress. Ready to be free of Public Speaking Anxiety? You can absolutely build confidence with public speaking if you are willing to gently face your fears and take a few simple practical steps. I know this because I have had a fear of public speaking myself, and have overcome it. Having just 3 hypnotherapy sessions, along with committing to a few simple actions can help set your course for more confident public speaking.